Directional drilling is the science of deviating a wellbore along a planned path to a target located at a given lateral distance and direction from vertical. This includes drilling as vertically as possible from a given TVD. 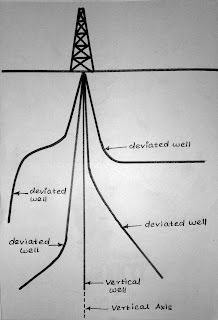 The figure below shows a vertical well and a deviated well. As a starter one can consider that any well which gets deviated from the vertical axis to achieve the desired target (hydrocarbon reserve in our case) may be termed as deviated well (or Directional well). What are the applications of Directional Drilling? Sidetracking is one of the primary uses for directional drilling. Sidetracking is an operation which deflects the borehole by starting a new hole at any point above the bottom of the old hole as in Figure below. The primary reason for sidetracking is to bypass a fish which has been lost in the hole; however, there are several other reasons for sidetracking. A sidetrack can be performed so the bottom of the hole can intersect a producing formation at a more favorable position such as up dip above the oil-water contact. A well can be sidetracked to alleviate problems associated with water or gas coning. A sidetrack can be performed in an old well to move the location of the bottom of the hole from a depleted portion of the reservoir to a portion that is productive, such as, across a fault or permeability barrier. Most often, a sidetrack is accomplished by setting a cement plug in the hole and dressing off the plug to a depth at which the sidetrack will commence. The sidetrack can be either "blind" or "oriented". In a blind sidetrack, the direction of the sidetrack is not specified and is not considered a directional well. In either case, a deflecting tool is used to drill out the old hole and start a new hole. Controlled directional drilling is used when drilling multiple wells from an artificial structure such as offshore platforms, drilling pads, or man made islands. The economics of building one offshore platform for each well would be prohibitive in most cases. However, since wells can be directionally drilled, forty or more wells can be drilled from a single platform. Without controlled directional drilling, most offshore drilling would not be economical. directional drilling can be applicable in fault drilling. it is typically troublesome to actually drill a vertical well because we are part of a steeply dipping, inclined fault plane. usually, the bit can deflect when passing in the fault plane, and typically the bit can follow the fault plane. to actually avoid the challenge, the well often is drilled upon the upthrown or downthrown side on your fault and deflected into your manufacturing formation. the bit can cross the fault at enough associated with an angle exactly where the direction on your bit can't amendment to actually follow the fault. 7. Drilling Salt Dome Region several oil fields are associated when using the intrusion of salt domes. directional drilling has also been utilized tap a number of oil that has also been trapped by your intrusion on your salt. rather than drilling in the salt overhangs, the wells often is directionally drilled adjacent towards the salt dome and into your underlying traps as shown in figure below. in spite of this, since the event of salt saturated and oil based mostly muds, the level of directional drilling has decreased. it's troublesome to actually drill long intervals of salt with recent water muds. directionally drilling along the salt, alleviates a great deal of the issues related to drilling salt. a highly specialized application for directional drilling is that the relief well. if a well blows out and is not accessible direct from surface, then a relief well is drilled to actually intersect the uncontrolled well close to the bottom. water or mud are then pumped in the relief well and into your uncontrolled well. since it is typically needed that the relief well intersect the uncontrolled well, the directional drilling has to actually be extremely precise and needs special tools. survey data isn't correct enough to actually intersect a wellbore at depth. proximity logging is needed when drilling relief wells. Horizontal drilling is another special application of directional drilling and is used to increase the productivity of various formations. One of the first applications for horizontal drilling was in vertically fractured reservoirs. In fractured reservoirs, a significant quantity of the production comes from fractures. Unless a vertical well encounters a fracture system, production rates will be low. Horizontal drilling is used to produce thin oil zones with water or gas coning problems. The horizontal well is optimally placed in the oil leg of the reservoir. The oil can then be produced at high rates with much less pressure drawdown because of the amount of formation exposed to the wellbore. Horizontal wells are used to increase productivity from low permeability reservoirs by increasing the amount of formation exposed to the wellbore. Additionally, numerous hydraulic fractures can be placed along a single wellbore to increase production and reduce the number of vertical wells required to drain the reservoir. Horizontal wells can be used to maximize production from reservoirs which are not being efficiently drained by vertical wells. Directional drilling can also be used to drill multilateral wells. Multilaterals are additional wells drilled from a parent wellbore. Multilaterals can be as simple as an open hole sidetrack or it can be more complicated with a junction that is cased and has pressure isolation and reentry capabilities. Multilaterals are used where production can be incrementally increased with less capital costs. Multilaterals can be used offshore where the number of slots are limited. It is also used to place additional horizontal wells in a reservoir. Another application of directional drilling is what is commonly termed extended reach drilling. As illustrated in Figure below, extended reach drilling is where wells have high inclinations and large horizontal displacements for the true vertical depth drilled. Extended reach drilling is used to develop reservoirs with fewer platforms or smaller sections of a reservoir where an additional platform cannot be economically justified. Extended reach drilling will become more popular as the cost of platforms in deeper water and severe environments becomes more expensive.